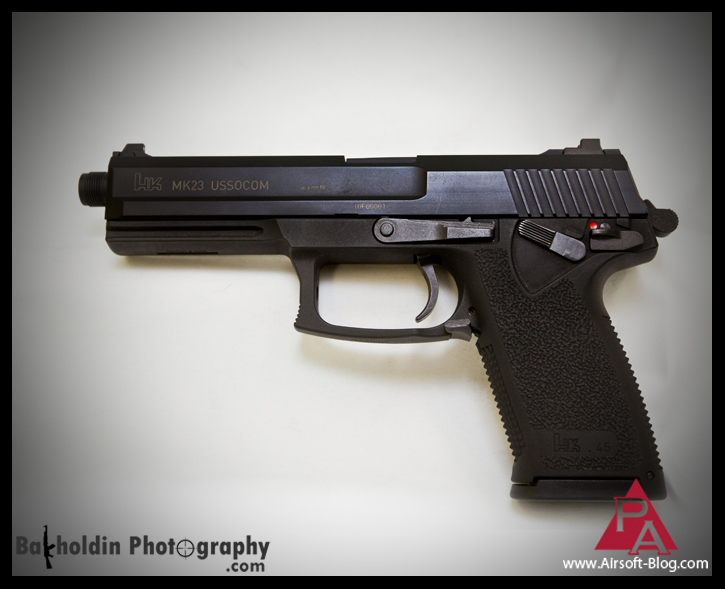 The KWA MK23 USSOCOM Gas Blowback Airsoft Pistol featured in this blog is a prototype. Any and all final versions sold by Pyramyd Air will be shipped with Federally compliant blaze orange tips. With all the madness of SB 798 still afoot, I'd suggest leaving those orange tips alone for *hopefully* obvious reasons. As fate would have it, the new KWA H&K MK23 USSOCOM airsoft gas blowback pistol has made it on to my exclusive "Must-Have" Airsoft guns list. It's certainly not the first KWA to make that list, though. You may have noticed that the Pyramyd Airsoft Blog was a bit quiet last week and I do apologize but I am pretty sure I can make it up to you. I spent the better part of last week hanging out with a bunch of new guns from a bunch of Airsoft manufacturers (brands). Naturally, I couldn't just keep the details of those new guns to myself, so I made sure that plenty of photos were taken to document this monstrous wave of new stuff. KWA had so many guns, that I enlisted the help of my favorite Russian Airsoft photographer, Dave Bakholdin of Bakholdin Photography. 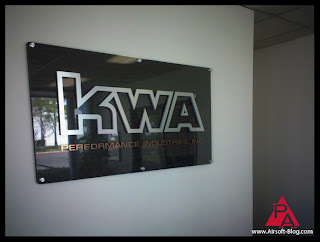 Together, we spent the better part of last Tuesday snapping photos over at KWA USA headquarters in smoggy & occassionally foggy, Southern California. While we were there, I desperately tried to pry as much super secret information about the coveted KRISS Vector Airsoft SMG & any other new KWA goodies on the horizon from of KWA Superstars, Allen Lau & Michael Hou. However, they were very "vault-like" (like...the state-of-the-art extra-locked kind). Allen actually asked me if I'd like the opportunity to avoid a hammer fist to the temple if I would stop asking questions about KWA's classified intel. Just kidding, but I think he secretly wanted to. Truth be told, Allen & Mike could not have been nicer to us and even gave me a quick tour of the premises at the end of the day. It was a surreal thing to experience hanging out in a sleek, professional office building with the sound of Airsoft AEGs and gas blowback guns being fired behind locked doors down the hall. Just knowing that there was something super secret going on behind those doors really upped the "awesome factor" of the day. If you should feel so inclined to repost any of these KWA MK23 USSOCOM photos elsewhere on the interwebz, please feel free to do so, as we feel it's quite flattering. All we ask is that you simply post a hyperlink to the Pyramyd Airsoft Blog with the photo(s) to let others know where you got them from. KWA did another outstanding job on this one. 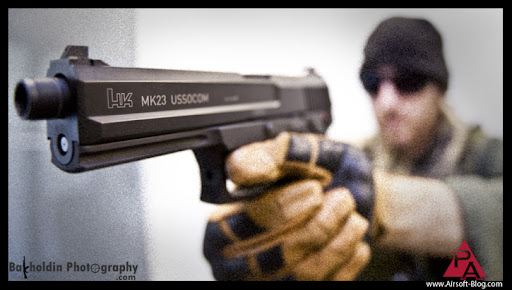 The KWA MK23 USSOCOM will likely shine very brightly amongst other guns in the arsenals of those fortunate enough to own one upon its release into the "wild." This model is a prototype of the final product, which I'm told is already starting to ship. 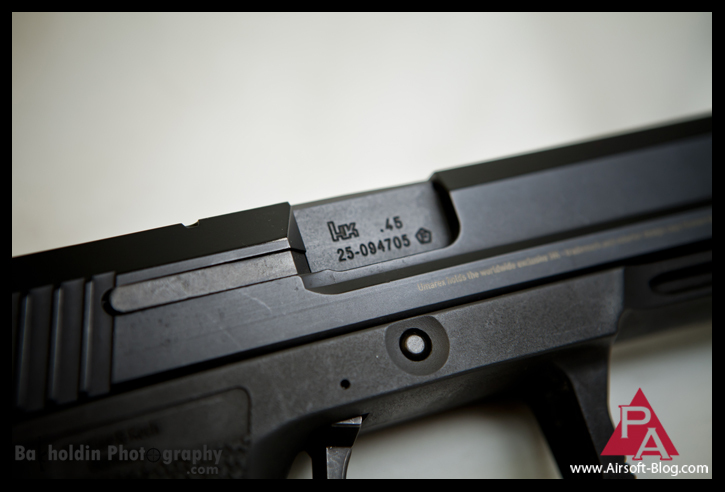 Heckler & Koch trades sub-licensed through Umarex. Not entirely sure what size the outer barrel threads are and I didn't bring my calipers, but they appeared to be pretty close to the industry standard 14mm. Don't quote me on that though. The answer is "yes." From left-to-right, you DO see a slide release level, functional de-cocking lever and thumb safety (just below the two dots). 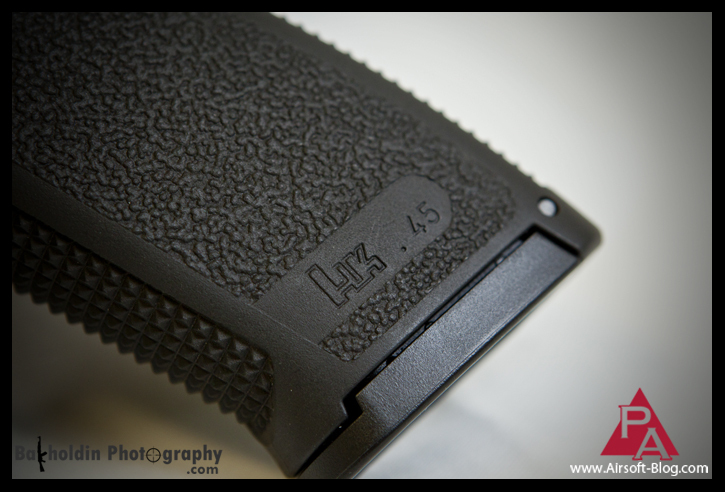 Heckler & Koch trades on the grip (left side). 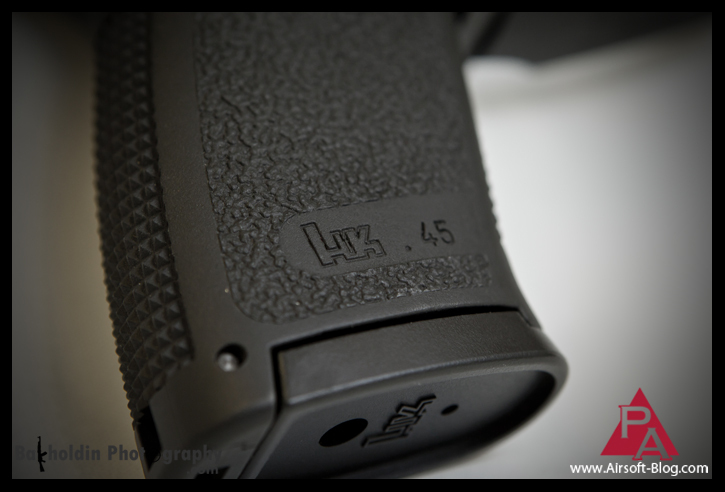 Heckler & Koch trades on the grip (right side). I believe they used a molding process, rather than a stamping process to get the HK logo imprinted. Either way, they're just just printed or painted on. Plus, check out that uber-nice soft rubber texture on the grip. Very nice attention to detail here! There's a few things going on in the KWA MK23 photo above that need attention. 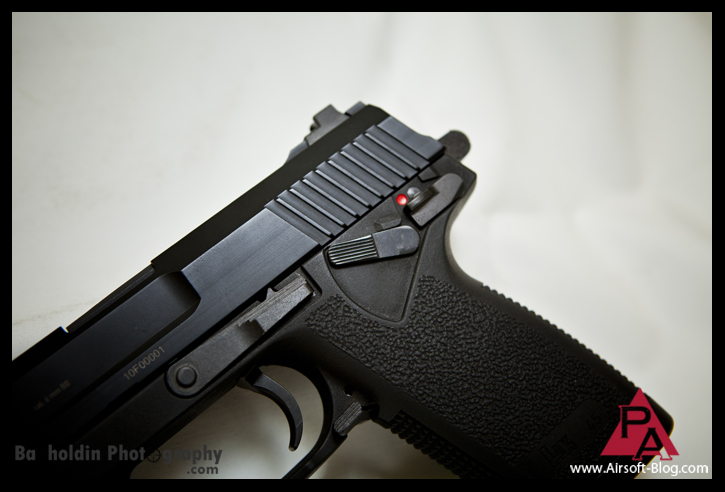 Note that this is the right side of KWA's new gas blowback gun and that it has an ambidextrous safety latch (under the red dot), raised Hecker & Koch trades including their country of origin (Deutshland) as well as an ambidextrous mag release which makes the KWA MK23 a phenomenal gas blowback sidearm option for those who are openly left-handed or those who like to run dualies (two guns at the same time, baby). That latter option lacks practicality in most cases, but makes up for it in "Fun Factor" and can be effective in a pistol's-only CQB environment or scenario. Speaking of KWA's attention to detail, check out that spring-loaded extractor that begins just as the rear slide serrations end. While non-functional, I still find it to be a nice touch that adds to the overall "Win Factor" that the KWA MK23 exhibits in spades. 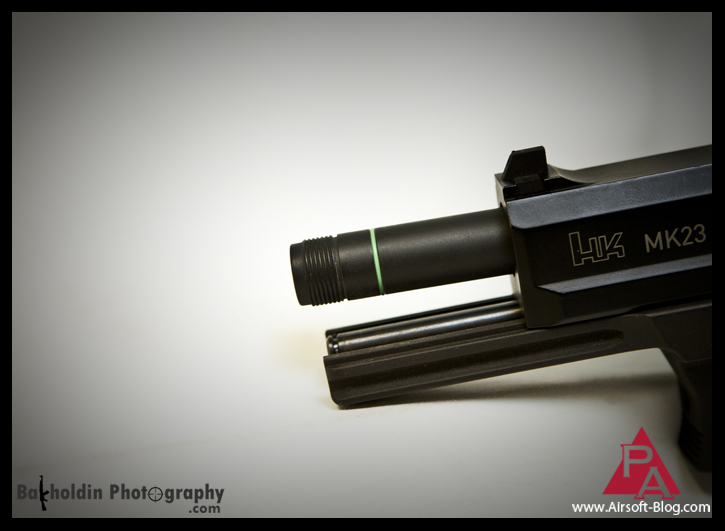 Oh yea, then there's that HK logo & caliber (real steel) set into the ejection port section of the outer barrel. I'd expect performance to be on par with their other NS2 internal gas systems, which is high. One important thing to note is that this airsoft gas blowback pistol is extremely large which has its advantages and disadvantages. 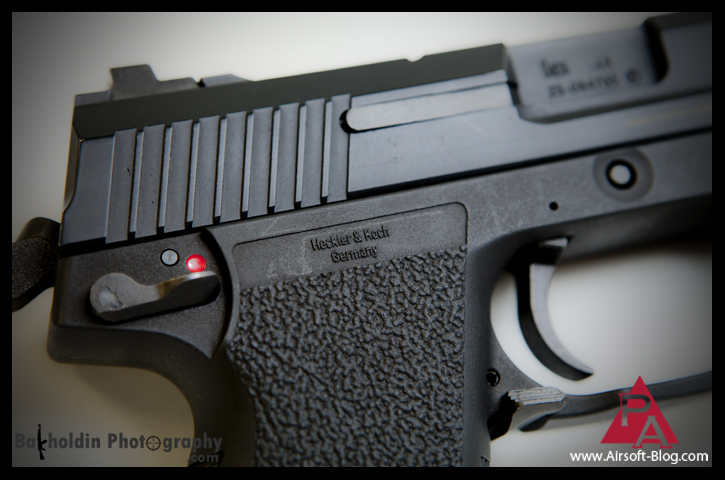 The longer barrel and medium-ish-profile sights make it easier to aim than a standard size Airsoft pistol, but it's extra-large frame won't fit most holsters. I actually use a modified 5.11 Tactical Radio Pouch with the bottom cut out & bungee cord for retention of my Tokyo Marui Mk23 SOCOM pistol, whose size will likely be closely mirrored by the KWA version. There are actually holsters made specifically for the Mk23 and other Airsoft hand cannons out there, but my 5.11 pouch actually works very well. Haters gonna hate. So there you have it. 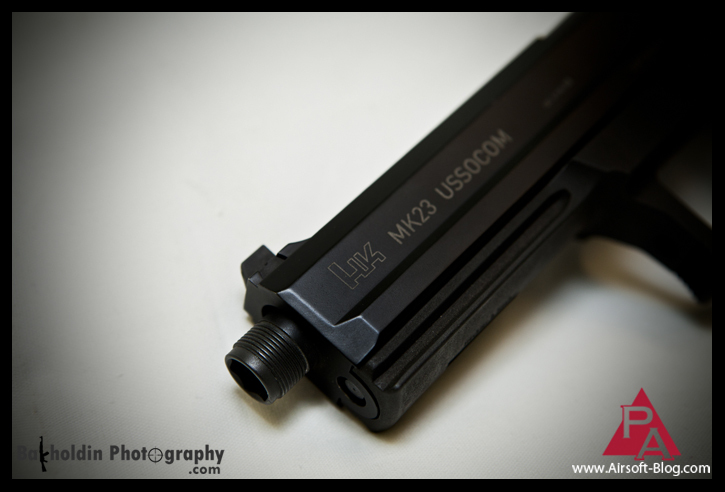 The KWA MK23 USSOCOM Gas Blowback Airsoft Pistol. What are your thoughts on this piece? Did I leave anything out that you would have liked to know? If so, post up in the comments section and I'll make sure to get you the info you're looking for. When was the last time you contact the California Assembly members to let them know that you're adamantly opposed to California Senate Bill 798 (SB 798)? It's essential for our continued enjoyment of awesome new Airsoft guns like the KWA MK23 that we continue to stay vigilant in our opposition of this bill. It has been amended and revitalized with stronger legs to gain approval from the Assembly so now moreso than the first time around, we need to be do everything we can to stop this bill. Even the simple act of being a good example of proper gun safety on & off the Airsoft field (keeping the orange tips intact and locked in cases during transport, etc.) is helpful.